Alright, this is the article you have been waiting for, after reading my recent film camera reviews. As I mentioned here, there was a specific reason for my sudden film adventure. Today I will reveal it. Some time ago, I had a discussion with a friend of mine (also a professional photographer) about film. The main questions were a) Is film still worth it in 2015 for pro use, and b) do you miss anything by not shooting film. Our common conclusions were, respectively: no; yes. There is something thoroughly rewarding in shooting and developing your own film. *at least for our kind of use: occasions, portraiture, low-light live music; for landscape photographers using medium or even large format, that's another story. I was challenged by my friend to try something for a few weeks: shoot film for my non-professional photos. At the same time (that was my own idea), I thought to do it in the cheapest, simplest way possible and present my findings to all of you. You see, since we can make the separation between pro/critical work and learning/hobby purposes, the dynamics regarding film change. Let's get this out of the way: with digital, in order to get a top-quality 24MP color "scan" you just need a D3300 (cost less than $500, brand new, with a decent lens). With film, check out the price on this thing! - A slide duplicator. For our purposes of using film (that is learning), this is by far the best value for money. If you're not sure what this is, it's basically like a lens attachment which can be mounted on your regular lens (it comes on 52mm, 58mm, or 67mm versions, so get the one you need, so that it will match a lens you own with that filter diameter). At the long end it has a position where you can insert slides or negatives. You then use your (digital) camera to take a photo of the negative - it's like a scanner, in a sense, only much much cheaper. Used, it will cost you about $30. Some are standalone units (i.e. you don't need a separate lens, you simply attach it onto your camera) - make sure you get a model suitable for Nikon. - Developer and Fixer. These are the only chemicals you need, really. You might hear someone saying you need more chemicals (e.g. stop bath or a wetting agent), but tap water will do just fine (instead of stop bath). I then simply wiped the film dry with a fiber cloth. All the major manufacturers are fine regarding developer and fixer (just follow the instructions). 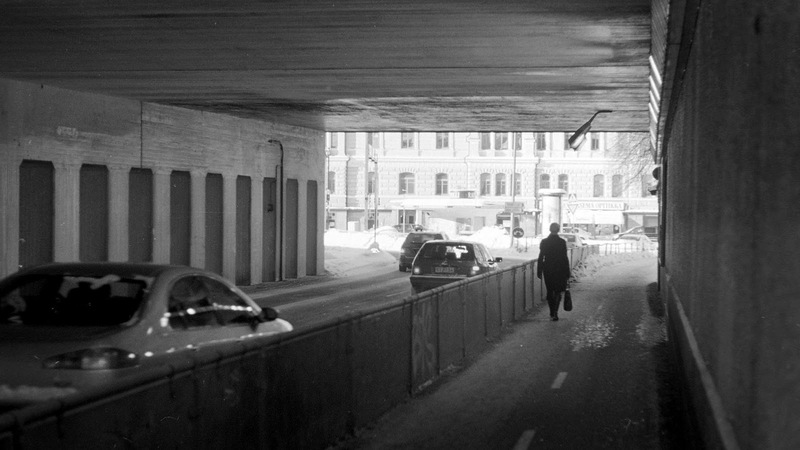 I use Ilford ID-11 and Ilford Rapid Fixer. I will not describe the process of developing itself - read the instructions on the developer and fixer bottles/websites (most developing tank & reel products also come with instructions), it is super-simple. Instead, what I want to focus on is the scope and lessons we can learn out of this little adventure. Patience: When you have a limited number of exposures (and when each photo costs 30c), you learn to compose with patience, and to press the shutter button if and only if it is worth it. Composition. For the same reasons, you overcome your laziness. If there is a tree branch spoiling the otherwise perfect vista, you do not take the photo anyway and check to see if it looks good (you usually think it is “good enough” and move on). Rather, you either position yourself different or move the branch, then take the photo. Understanding Light. If you need to pay attention to all of these details (plus keeping an eye on White Balance - if shooting color - and how things like shadows or clouds affect it), you learn to understand light and how it affects the scene. New Possibilities. The incredible thing is that things worth photographing are all around us, provided we truly keep our eyes open. Shooting film can help you with that, too. Perhaps you think you can do these without film. It is possible, yes. You can indeed try to exercise with your digital camera. Is it the same? I'm not sure, probably not. I consider myself a very experienced photographer, and this little experiment still taught me some things I had not considered before. I suggest you at least try it. I know one thing for a fact: although digital is my medium (for professional and non-professional occasions alike), I will keep using film.